Some colors aren't always high-contrast against certain backgrounds, a big offender is magenta against cyan. Is high-contrast important? I think it is so that all the applications out there can use whatever on whatever background and not worry about unreadable text. But I dunno, there are some great themes in here but they seem less-than-idea to me. Well, whipped up my own. I'm actually really pleased with it! My other handcrafted color scheme was terrible. The main thing I was going for was visibility: every color should be easily visible on top of every other color. I might be able to get that and still tone down the intensity...It'll take some fiddling though. I agree that the colors are fairly bright, but it doesn't bother me. Made a darker one that retains most of the qualities of the first...but it might be too dark, I dunno. A very nice color scheme, I like! I think it is so that all the applications out there can use whatever on whatever background and not worry about unreadable text. 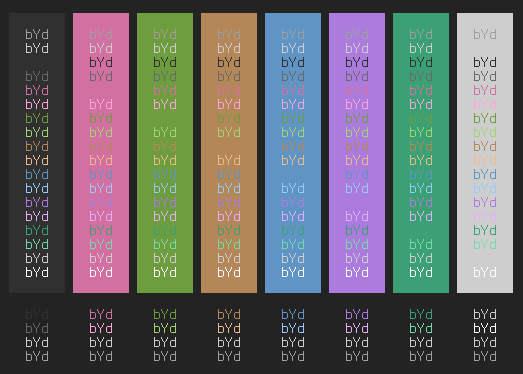 These are my .Xresources colors. Most of the colors are from the Solarized scheme, except normal text/foreground and background, which I picked for orange/blue (#ffaa00/#17165f) for contrast and readability with a dimmed screen and low color temperature via redshift. It's too easy to get eyestrain otherwise. If there was a monitor that used the Kindle e-ink stuff I'd buy it. Here is my port of Vim's awesome xoria256 color scheme to the terminal. Enjoy.
! xoria256 terminal color scheme                  ! My colorscheme has come a long way. I would like to share, but where do I get that nifty colors shell script? ^ Like this one, mind posting the hex-codes? Or just pick the colors from a picture. It still needs a little more work—change color tinting, generate light-on-dark schemes, deal with images that have less than sixteen colors, etc.—but, so far, has been doing a fairly nice job.